In the L.A. City Section Championships, View Park High School lost to Nathaniel Narbonne High School. Narbonne was set to advance, but after their win, they were disqualified L.A. City Section Open Division finals, and were barred from further state competition. Not because of cheating or anything, but because the pink lettered uniforms Narbonne wore against View Park were later declared "illegal." It&apos;s just another example of adults failing to show common sense when working in youth sports. 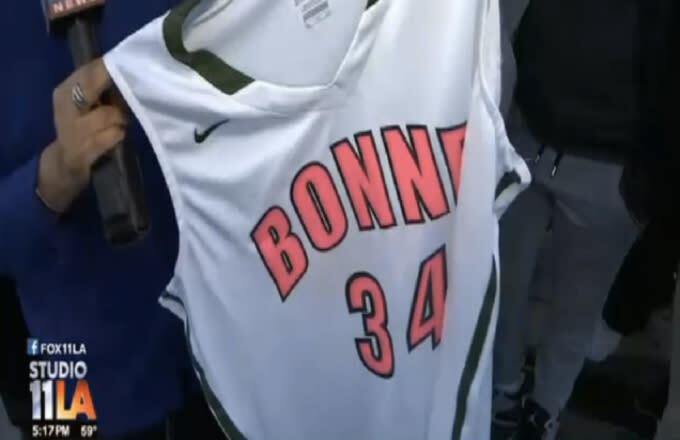 Instead of the school&apos;s traditional green and gold uniforms, Narbonne wore the pink alternates to support the Women’s Basketball Coaches Association. Every February, the association hosts “Play 4 Kay" to honor North Carolina State women&apos;s basketball coach Kay Yow. After notching over 700 career wins, Yow passed away in 2009 due to breast cancer. All Narbonne wanted to do was to honor Yow and bring attention to the Kay Yow Cancer Fund, and now they&apos;ve been punished. According to Article 1305 in the L.A. City Section Goldbook, "Uniform colors may only be a combination of the official school colors as listed in the Board of Managers Gold Book." The pink variant violated these rules, and head coach Victoria Sanders wasn&apos;t aware that a special waiver would be needed to get the pink uniforms approved by the City. Exactly. Don&apos;t punish the girls, who were just following orders, and as young women, thought they were representing something noble. What makes the situation even more baffling is that Nardonne had worn those exact pink uniforms in the same tournament just 11 days prior before. In a first round game against University High School, Nardonne played in pink and won, but because nobody on University seemed to know about the rule, Nardonne played on in the tournament. SMH. Here&apos;s where we stand: Inconsistent enforcement of dumb rules that only hurts the kids in the end. Brilliant stuff, L.A. City.